Alpari are no longer trading. For a list of alternative brokers, and full comparison reviews, visit our brokers page. 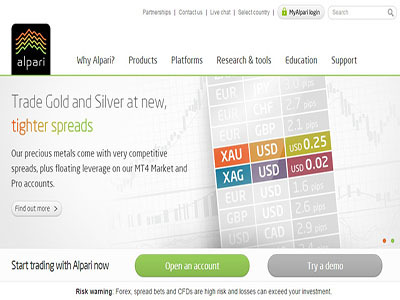 Better known as an online forex platform, Alpari have recently ventured into the world of binary trading. Now apart from being able to trade forex and CFDs, traders can now also try their hand at binary trading with this award winning broker. The binary offerings were made possible through a partnership agreement between Alpari and Binary Products Ltd to allow Alpari traders access to this exciting line of products. Trading of binary options is done on a MarketsPulse powered trading platform, a leading independent provider of online binary trading platforms. At first glance, the Alpari Binary platform is looks really crisp. The interface is well designed with all relevant trading information on hand. Prices are quoted with five decimal places with the last three digits significantly enlarged to emphasize their importance. We all know how easy to miss changes in prices when everything is denoted with small numberings. By doing this, Alpari help to ensure that traders don’t trade by mistakes as prices are constantly being updated in real time. The trading platform can also be displayed in different layouts. However, Alpari binary trading platform is one up from all the rest as they also provide a layout which can display up to 16 assets at one time! So far, only Alpari has this type of layout format. Actual trading is also fast and efficient with minimal number of steps required. Once a trader has decided to trade, a separate window will pop up on the screen requiring the trader to “Apply” or “Cancel”. Again, this helps to avoid accidental trades. There are two main types of trading contracts offered by Alpari, High/Low options and Pair trading. This is a relatively new type of binary trading that is currently offered by just a handful of binary brokers in the industry. The idea is to pit one asset against another and see which one wins. For existing clients of Alpari UK, they can just activate the binary trading account through their “MyAlpari” dashboard. New clients however, have to go through a different process. They have to first fill out an application form and submit it to Alpari. Upon submission, the new client will be given access to the MyAlpari account management tool where supporting documents can be uploaded to. Upon verification of the documents, traders will be advised of their account number, login and password by Alpari. Take note that the minimum initial deposit needed is $/£/€/A$/S₣100 or ¥10,000. On average, the payouts offered by Alpari are around 80%. At present, there is no mention of any rebates for out-of-the-money trades. Currently, Alpari have 50 underlying assets for traders to choose from. They include 10 types of commodities, 16 types of currency pairs and 24 types of indices. Do take note that the service is only available from 07:00-22:00 (UK time) Mon-Fri. Only the forex dealing desk has 24/6 service. Having established a reputation as being a credible and trustworthy forex broker, traders should have no concerns about dealing with Alpari. In addition, trades can take comfort knowing that Alpari UK is regulated by the Financial Conduct Authority (FCA). This mean they have to meet with strict regulatory requirements to operate from the UK. Alpari has always strived to provide the highest quality of service to their clients. Although they are new to the binary trading scene, their corporate philosophy has never changed. This is apparent from the way they conducted their business even with this new platform. In my opinion, it’s good to be able to trade binaries with a leading long established broker like Alpari.